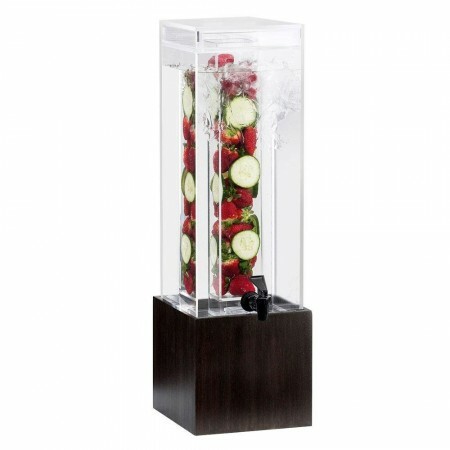 A must-have in any restaurant, cafe, or catered event, the Cal-Mil 1527-1INF-96 Midnight Bamboo Acrylic Beverage Dispenser with Infusion Chamber 1.5 Gallon invites customers to help themselves to your specialty drinks. Featuring a removable infusion chamber, this dispenser adds a burst of natural flavors to your drinks by adding slices of lemon and other seasonal fruits. The perfect harmony of form and function, this premium quality server has a crystal-clear, exceptionally durable acrylic container that beautifully showcases your colorful beverages. Thanks to its attractive midnight bamboo base, this BPA-free beverage dispenser is elevated to a cup height for convenient filling while its easy-to-use spigot ensures quick dispensing. Perfect for fast-paced, commercial settings, this beverage dispenser comes with a drip tray to minimize mess. For easy cleanup, the infusion chamber and spigot are removable.